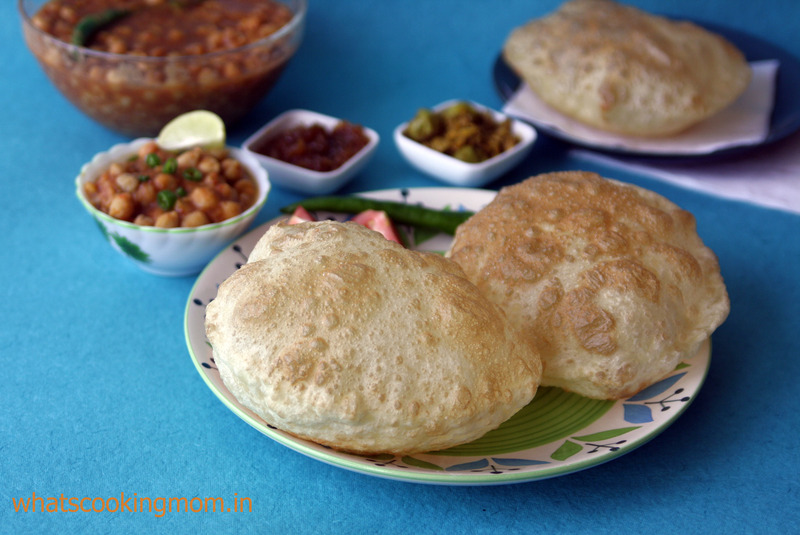 Chole Bhature – Chole Bhature is a very popular dish when eating out. 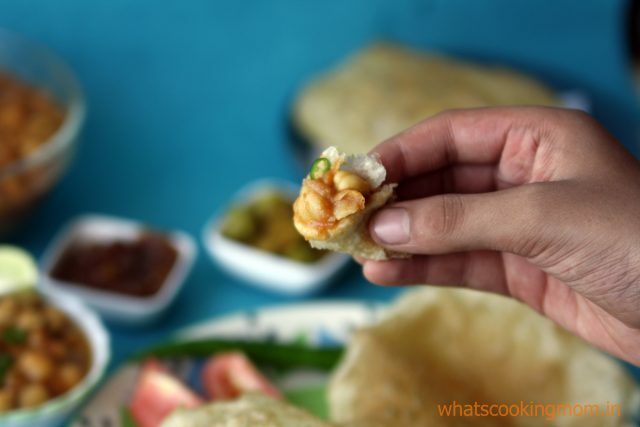 It is a mini meal generally served with pickle and tomato onion salad. 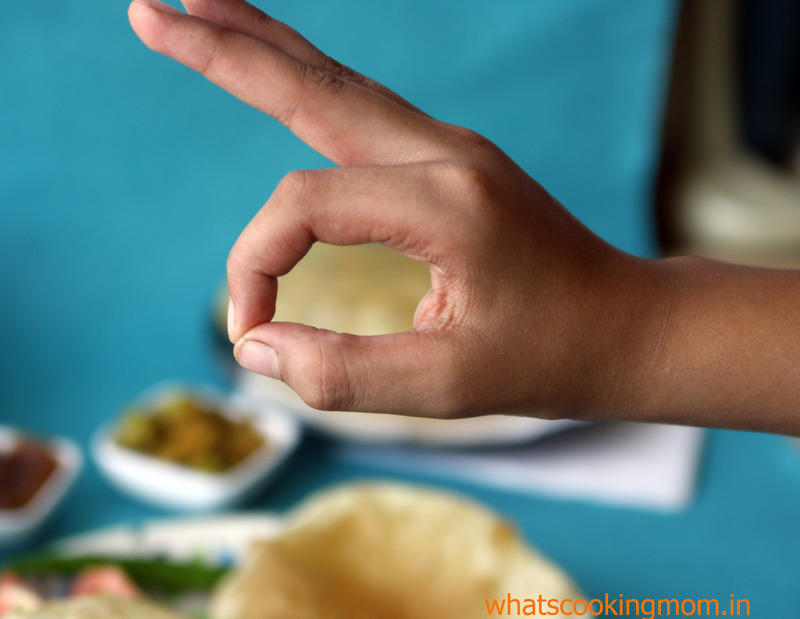 In restaurants, you get this huge balloon like bhaturas that are simply hard to resist. 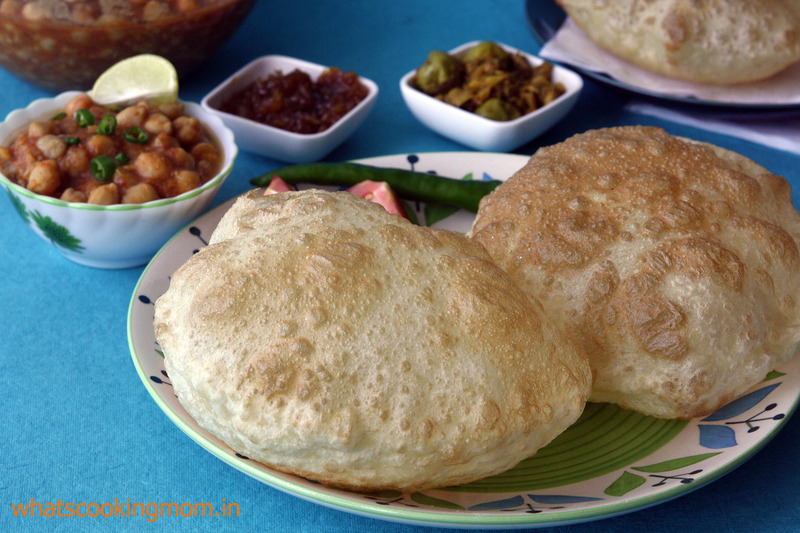 Though Bhatura is deep fried food its dough is fermented so we do not mind eating it. And chole, as we all know, is protein packed. 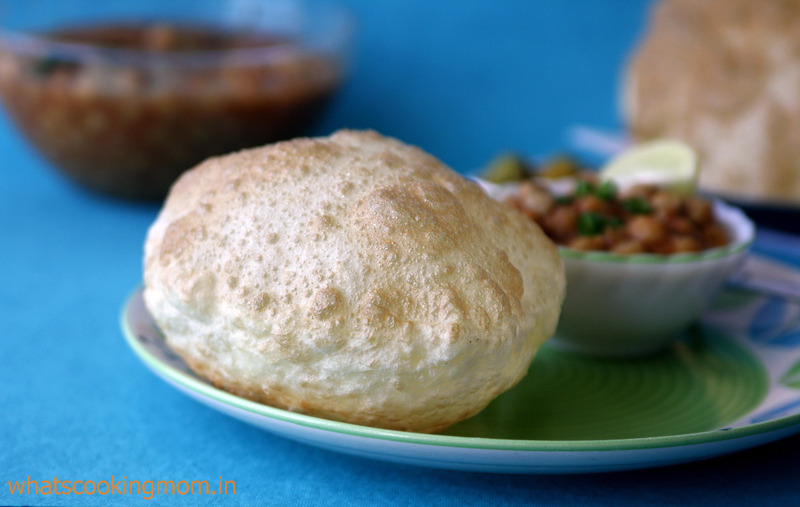 My kids love to eat chole bhature and I love making them at home. These hardly take any time to make. Soak channa in the morning. Prepare the dough and leave it to ferment. So when you come into the kitchen in the evening you feel like there is not much left to be done. And this fry really fast. 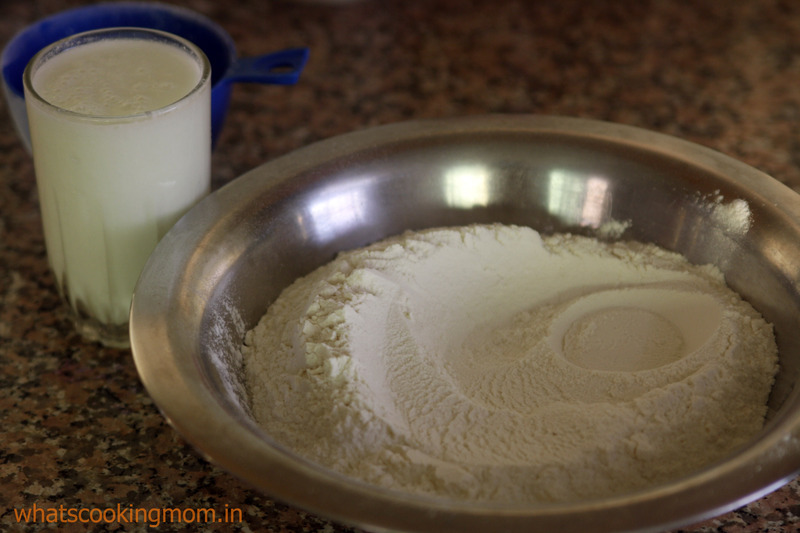 Add water to the curd and mix properly. If my curd is not very sour I generally leave it out of the fridge for 1-2 hours. 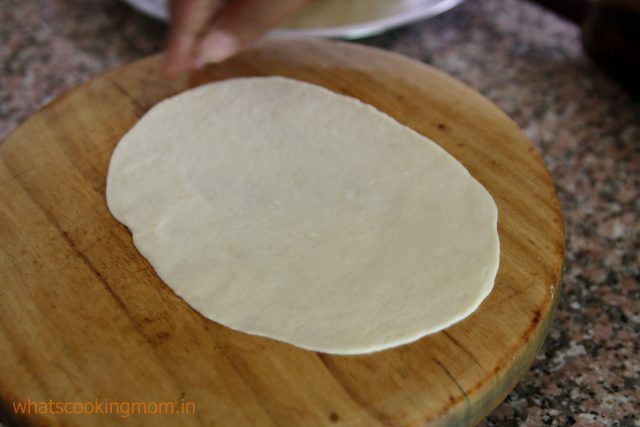 In a wide bowl take maida and with the help of water curd mixture make a smooth dough. Use more water if needed. Leave it covered for 5-6 hours for the dough to rise. 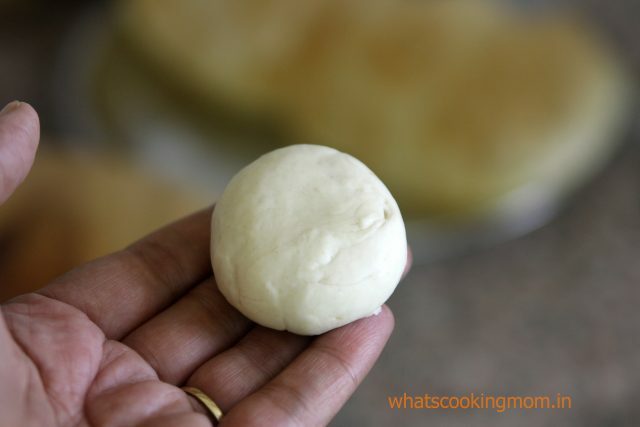 In winters you might need to keep the dough out in the sun for it to ferment properly. But in summer you can keep it indoors. 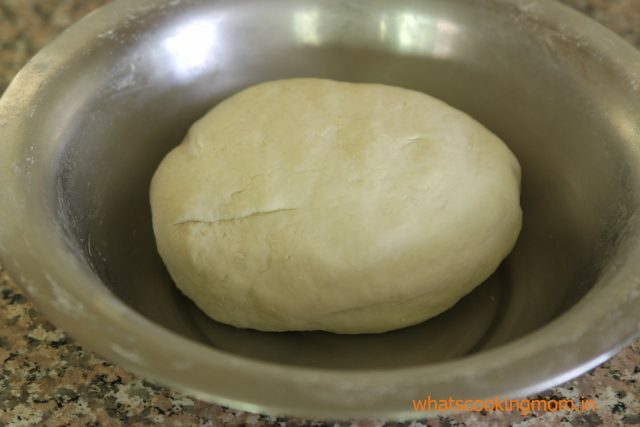 Your dough will rise after fermentation. Press lightly between your palms. 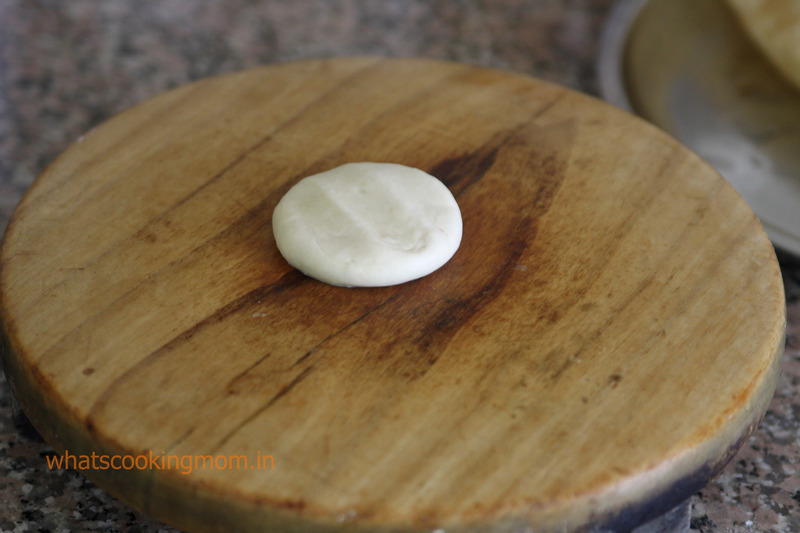 Grease the rolling pin and chakla/board with oil. 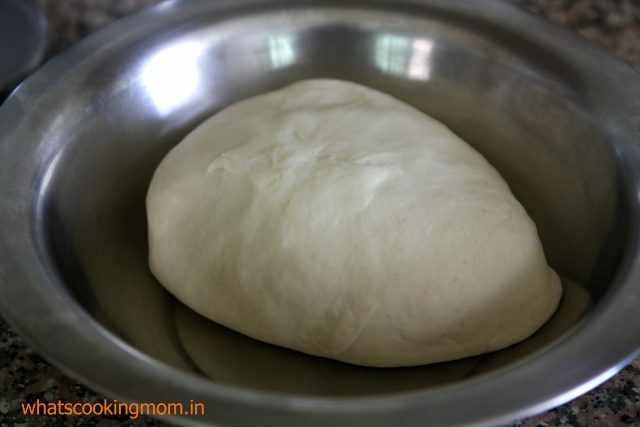 Roll out the dough into an oblong shape. Heat oil in the kadhai. When the oil is hot fry one bhatura at a time. 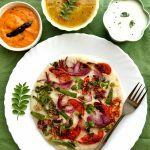 Slip bhatura in hot oil and let the bhatura inflate and turn light brown. Turn it over and cook the other side also. 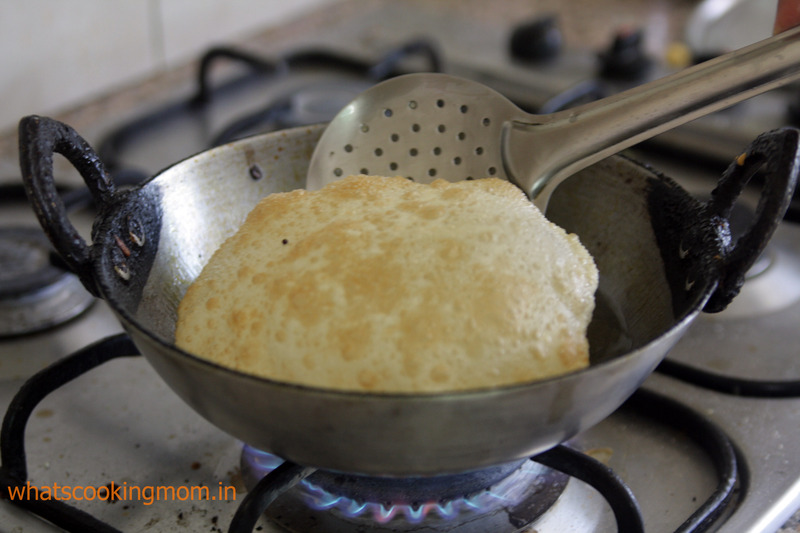 Oil is quite hot for frying bhature so you have to be quite careful while frying. Drain on a tissue paper or newspaper to remove the excess oil. 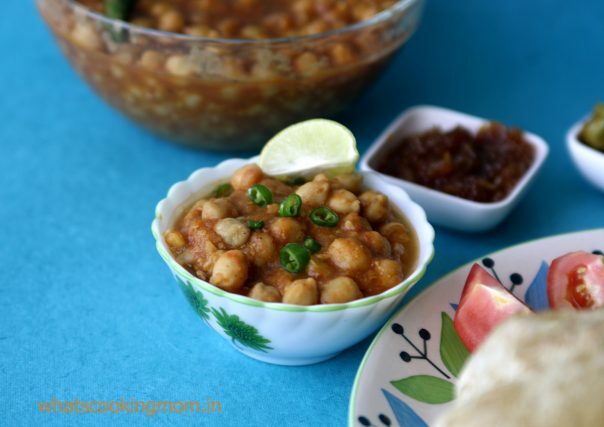 Serve with hot chole. Pressure cook chole and channa dal with salt for 25-30 minutes (Two whistles on high and then turn the flame to low. Let it cook on the slow flame). Add more water if required. I generally keep 3 cups of water for 1 cup chole. Cut tomatoes into small pieces or puree them with ginger and green chili in the blender. I puree them as my son does not like tomato pieces in it. Meanwhile to prepare masala, heat oil in a kadhai. 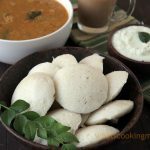 Add asafetida, jeera and tej patta. 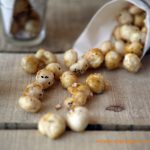 When jeera starts to crackle add chole masala and red chili powder. Immediately add tomato puree while stirring continuously. Cook for some time till oil separates. 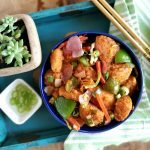 Garnish with coriander leaves and serve hot with bhature. 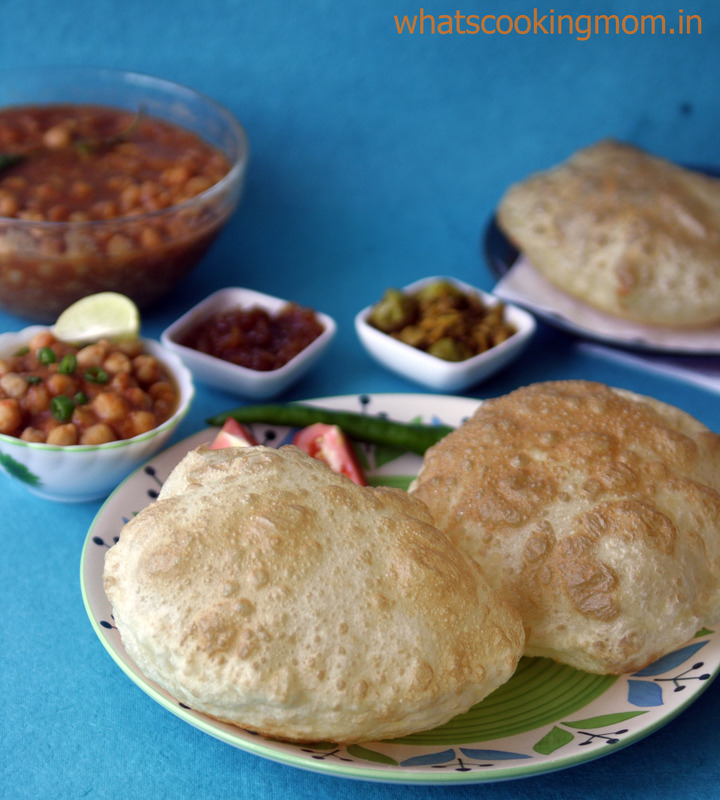 Enjoy Chole Bhature at home. 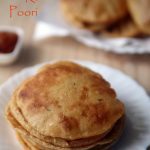 I was looking for Chola bhatura receipe from a long time, finally got it. I’ll definitely try It out. I have few doubts though, don’t we need salt in Bhatura dough and is Onion not required for Gravy? Hi Devika. I do not add salt in the bhatura dough. There really is no need as we eat these with chole. If you want you can add onions to the gravy. WE like it without onion that is why I do not add them. Thanks a lot for the recipe. Enjoyed lovely bhaturas today, thanks to you. You have a beautiful blog. 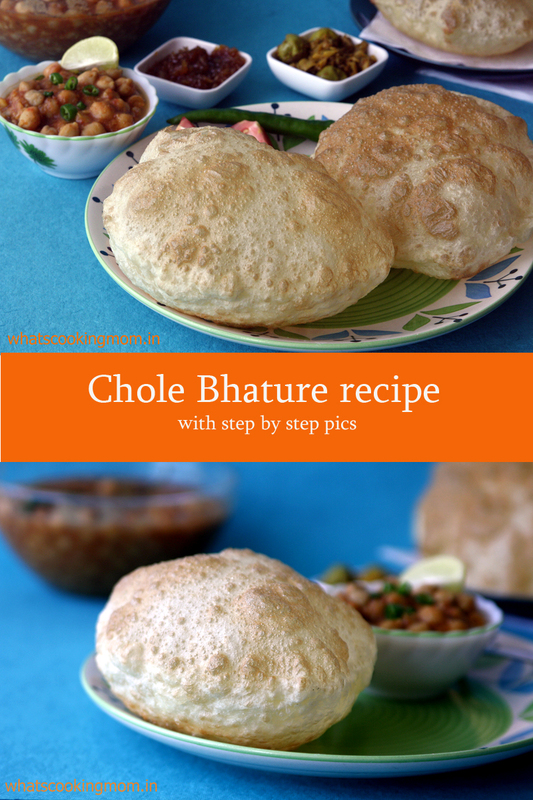 B0okmarked this…I love chole bhature. I am just superbly hungry now! Go get a bhatura for yourself Pratibha 😉 Have fun. Mmmm!! Looks yummy! 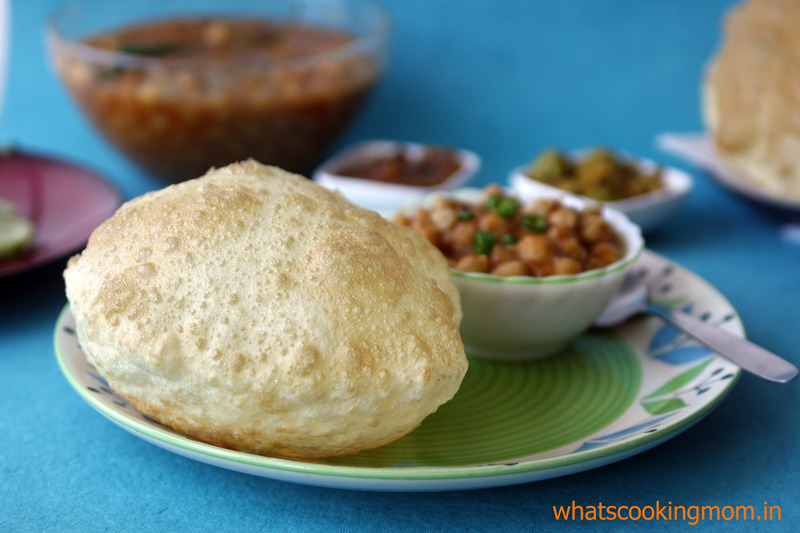 I’ve never made bhature before, so I’ll definitely follow your recipe! I think all families are like this. Everyone orders something and then when the food comes you always feel like the other person ordered better. And I have to say your Chole Bhature looks just yuuuuummmmmm Nidhi! Thanks Swapna :-). Its like having a buffet dinner when everyone’s orders finally arrive. I just love it. Anu Dev recently posted…Life Is Beautiful………………………………………………..
so so Enticing….Perfect Chola Bhatura….Loved your detailed recipe style with pictures!!!! Happy to follow you!!! Please do my space too! Very detailed. I just love chhole bhature :)!